In the last three to four years, many new directors have ventured into the world of filmmaking in Assam and have tried to portray stories, issues and developments rooted in the local and regional sphere. Amongst such new voices, names Rima Das, Reema Bora and Bhaskar Hazarika have really shown promise through their maiden efforts and have won accolades critically and commercially. Rima Das’s Village Rockstars was India’s official entry to the Academy Awards this year, while Reema Bora’s unreleased Bokul, through impromptu and invited shows across the country, has touched the hearts of viewers. Very recently, Bhaskar Hazarika’s Amish has been selected for premiere at the Tribeca Film Festival while Meghalaya boy Dominic Sangma’s Rimdogittanga (Rapture) is being picked up by La Fabrique Cinéma, Cannes. Whether it is Manipur or Assam, the striking dimension is that all these directors are a creative bunch of young talents who seem determined and passionate about the art of cinema as a vehicle for reflection on life and society around them. On the same lines, Monjul Barua is another such young director who has created a niche for himself initially as an assistant director and then coming up with his well received Antareen in 2016. His second film Kaaneen had its premiere in the second year of the Guwahati International Film Festival where it managed to win the Silver Camera award. The narrative of Kaaneen revolves around the life of a seemingly happy upper class middle aged woman named Mandira Baruah. Her relationship with her husband Abhijit Baruah, a top police official in the city of Guwahati, is fluid and peaceful. All hell, however, breaks loose in her somewhat inner complacent world when one fine day she encounters an abandoned infant in a town street. The sight of the baby hits a raw nerve in her soul which makes her take the baby to the hospital to receive medical care. The rest of the film’s proceedings are largely based on the repercussions this incident evokes in the mind and memory of Mandira Baruah. All along she had kept an unsavory chapter from her life’s secret to her husband which was about her experience of giving birth to a baby out of wedlock in her adolescence. The film is basically about the journey which leads her to come face to face with this ghost from her past and exorcise herself in the process. Although the film is an emotional social drama, it gets the treatment of a thriller from the director. The tension emerging from the socially sanctioned and non-sanctioned behavior is exploited to pace the film and as a form of comment on the contradictions sequestered in a genteel upper class haven. The viewer is kept engaged as the narrative shifts back and forth between the past and present of Baruah’s life. The couple of scenes featuring interactions between Baruah and her mother heighten the tension as the frames do not allow a breathing space for the viewer. The editing is smooth and judicious. As the scenes from the past and the present are presented, one sees the intertwined connections in the emotional arc of the story. The music by Tarali Sharma is soothing and in fact, to be precise, it is in the sound aspect which makes the scenes (handled by the expert hands of Amrit Pritam & Debajit Changmai) come alive and leave an impact. The sensitive subject of the film probably would not have come across in such a sensitive manner had it not been for the fine performance by Jahanara Begum in the role of the protagonist Mandira Baruah. She evokes the emotions of a mother beautifully as she is torn between her affection for her legitimate and illegitimate son. Acclaimed theatre artist Baharul Islam also delivers a top notch performance as a top cop in control of his life and composed about his emotions. Joly Bhatacharya as mother of Mandira is also very natural along with Partha Hazarika who plays the pivotal character of Rajiv (the illegitimate boy). Rajiv’s world in the poverty ridden fringes of the city is the opposite of the prosperous social space of Mandira. In the circumstances she finds herself in, Mandira can now only hope to buy him a Wrangler t-shirt and bring him chicken rolls as she begins to get close to him in the socially determined class equation of master and servant. The price of her premarital mistake is that she is now the envied upon wife of a high profile police officer while Rajiv ekes out a living as a mechanic in a garage. Ironically, he specializes in fixing old vintage cars whereas his biological mother is looking for a way out from her old wound fixed as she is in a socially conventional world. In an otherwise grim and moody film marked by melancholic emotions, one gets comic relief from certain smart one-liners (e.g the banter between Mandira’s offspring/played with aplomb by Rahul Gautam Sarma and Kasvi Sharma) and dialogues. Dhananjay Debnath in the role of the Bengali garage owner Dey babu is also hilarious in a couple of scenes. But to the credit of the film, the humour does not feel forced and only adds to the overall realist form and sensibility of the film. The authentic set design and the real locations whether indoors or outdoors also help in this regard. The casting by assistant director Ronald Hussain is almost spot-on for all the characters. The cinematography by Nahid Ahmed captures Guwahati in its glorious best in night long shots and creates evocative compositions involving the hills and rivers of the city. Virginia Woolf’s characterization of Mrs Dalloway in the novel Mrs Dalloway in the stream of consciousness form was a revelation in feminist literary aesthetics as well as modernism. As Mandira goes on and about her secret search in the city, one encounters a Mrs Dalloway like figure in her; lost, as she is, in her memories,visions and reveries. Like last year’s Calender directed by Himjyoti Talukdar, Kaaneen too eschews formal experimentation and relies on good old story-telling while reflecting a middle class ethos and sensibility. 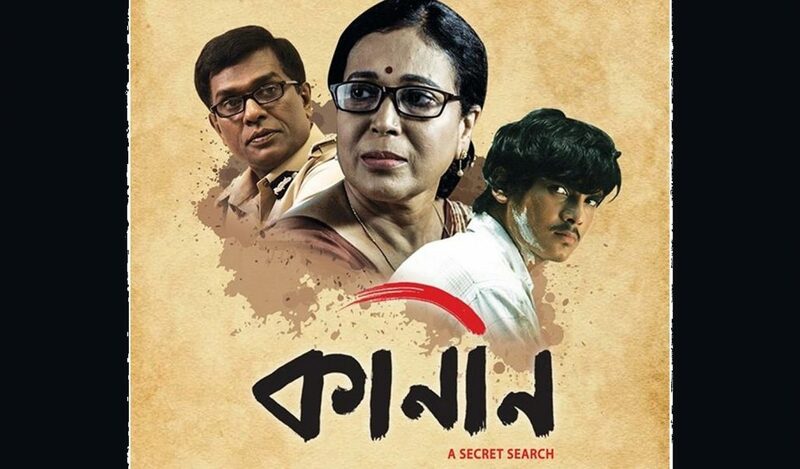 Based on Assamese writer Rita Chowdhury’s novel Rajeeb Eeshwar and written by her for the screen too, Kaaneen benefits from having a writer of her caliber on board. The scenarios and the dialogues never feel jilted and feel part of the social worlds depicted. Director Monjul Baruah steers the film well in most of the aspects (including the intriguing title) and is a promising new director, for sure, in Assamese cinema. After the debacle of last Assamese release Kokaideu Bindaas, one hopes Kaaneen gets a decent run at the box office because it definitely deserves to.